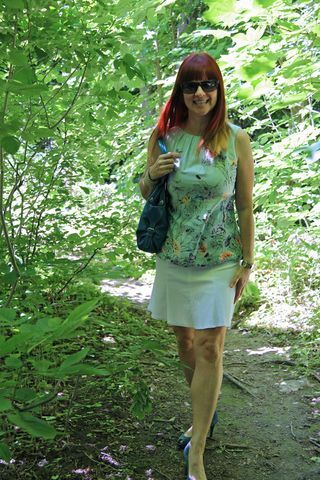 Yes I am in love with the lovely Dorothy Perkins line of clothing from the UK. Here is another sweet example of the line that I got as a birthday gift. 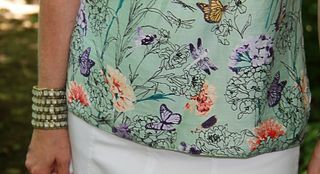 A cotton top with a gorgeous butterfly garden pattern in a fresh mint. You don't see the back here, but it buttons up from behind. A cute fashion detail, but murder in the changing room when you're trying to get it on by yourself. You bring up a good point. How does the designer think I’m going to get a button up the back top on my body without a significant other to button me up? Haha! Too funny, I always have issues with the buttons (even zippers) on the back of a top or dress. But this top is so pretty, nothings is better than a beautifully printed top, looks gorgeous with your hair!